I was a science student and yet science never excited me. I did not care what is reacting or what is transforming, for me it was all ‘school work’ and nothing more. However, ever since Little B has started tugging me with her constant “why,” my whole take on science has changed completely. It all started with me just trying to answer one of her questions. Something like “why has the banana got brown spots” or “why are bubbles coming out of fish’s mouth?” I answered her questions by giving an explanation to the best of my knowledge or by showing her related pictures or videos over the internet. Gradually, it became an obsession. I started to love doing this – finding out more and more about a simple phenomenon. Turned out I liked science. All this while, it was the theoretical and textbook science that kept me away from understanding the real science. And now with Little B asking the simple everyday science questions, it has started amazing me as to how much can science help us in understanding the world around us. And that is why me and my daughter do at least one science experiment at home each week. Oh the science experiments! Little B loves them. The anticipation of what is going to happen makes her crazy like anything. A simple soft drink fizzing up inside its bottle makes her laugh hysterically. Yeah I know, it’s amazing to see what all can amaze a child. Last week we made a bouncy egg out of an ordinary egg. The experiment was pretty fun and here’s how we did it. 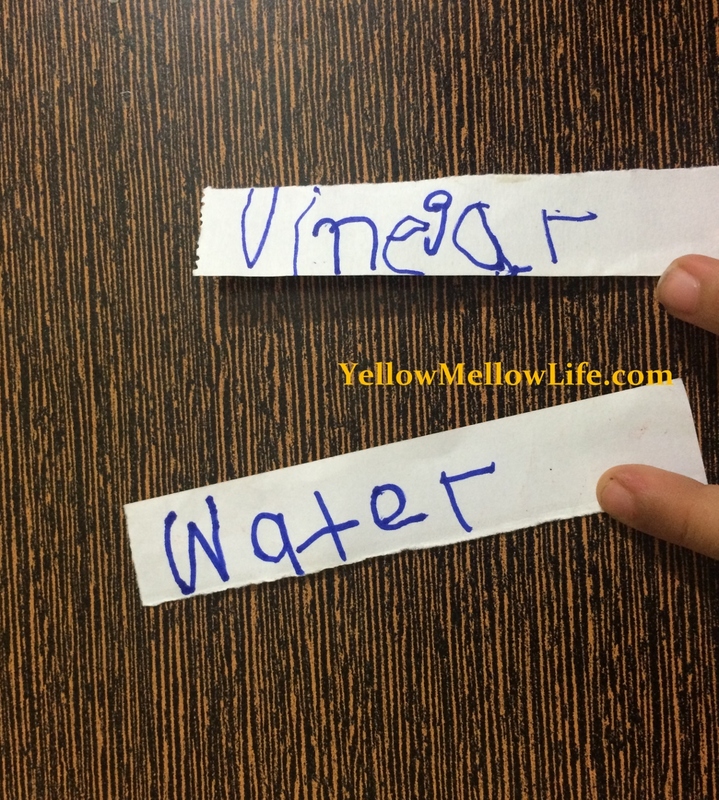 We started by preparing two labels to be put over the two containers, ‘water’ and ‘vinegar.’ And then we stuck these labels on the two different containers using a cello tape. We filled the glass labelled ‘water’ with water and the one labelled ‘vinegar’ with vinegar (of course!). 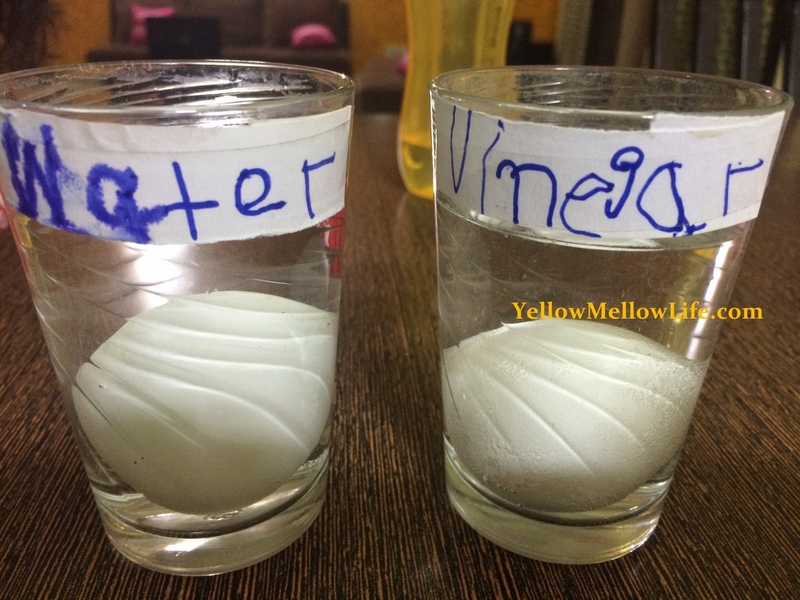 One egg was gently dropped in water and the other in vinegar. Eggs should be submerged in the liquids. 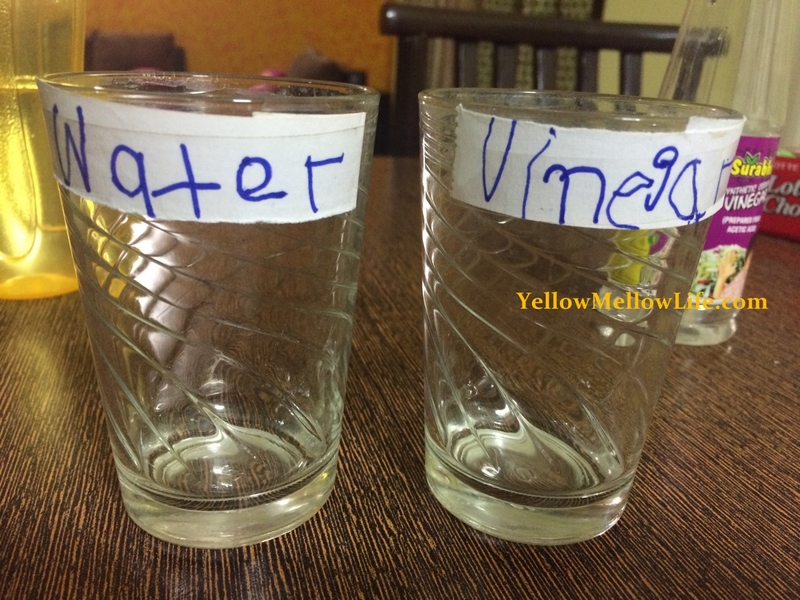 Both water and vinegar look similar and that confused my daughter a little bit. So I also let her taste about ½ teaspoon of each water and vinegar and that’s how she understood that we are putting eggs in different liquids. Instantly we saw bubbles forming on the egg shell kept in vinegar. That’s vinegar (acid) reacting with egg shell (made of calcium carbonate). Bubbles are just carbon dioxide getting released due to this reaction. We left the eggs as is for 5 days (sometimes it can take up to 7 days). I let Little B touch the eggs every day and feel the difference. On 5th day, we noticed that the egg submerged in water has not changed at all. However, the one in the vinegar had its shell completely dissolved and so I took the egg out of vinegar. There was plenty of residue stuck on it which I removed by gently rubbing egg with fingers and rinsing with water. 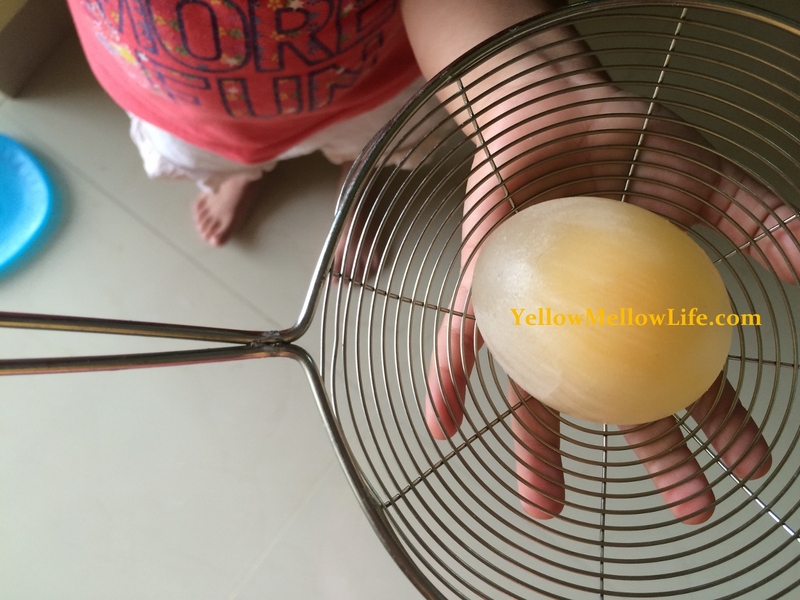 The egg now looked translucent and we were able to see the yolk inside clearly. With the hard shell gone, the whole egg was contained within a delicate membrane! What we had in our hands now was an amazing toy. When we slid it on the floor, it wobbled. We dropped it gently from an inch above the floor and it bounced! We tried dropping it from as high as 5 inches and it still bounced (just be gentle while you do that). Little B played with the bouncy egg for a long time. She then kept it back in a glass and I submerged it in water. She played with it again the next day and then the next day and after that she forgot about it and got busy with something else! How To Get The Child Excited About The Experiment? Can you open an egg without cracking it? What is going to happen if we keep the egg in water for some days? 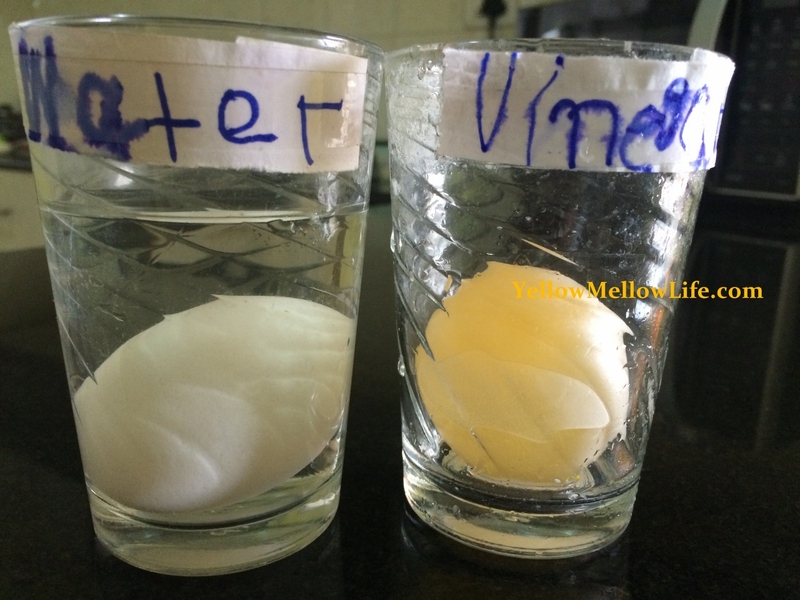 What is going to happen if we keep the egg in vinegar for some days? For example, Little B’s hypothesis was that egg in water will remain the same but egg in vinegar will become sour as it will start tasting like vinegar after a few days. I have been doing home-based science experiments with my daughter for a while now. Off late I have started encouraging her to record her observations, to make the activity a little more “scientific.” She likes it because she gets to draw what she observes. For this bouncy egg experiment, we noted observations like this. I wrote the text while she drew pictures. Little B’s How To Train Your Dragon Birthday Party – Happy 4th! 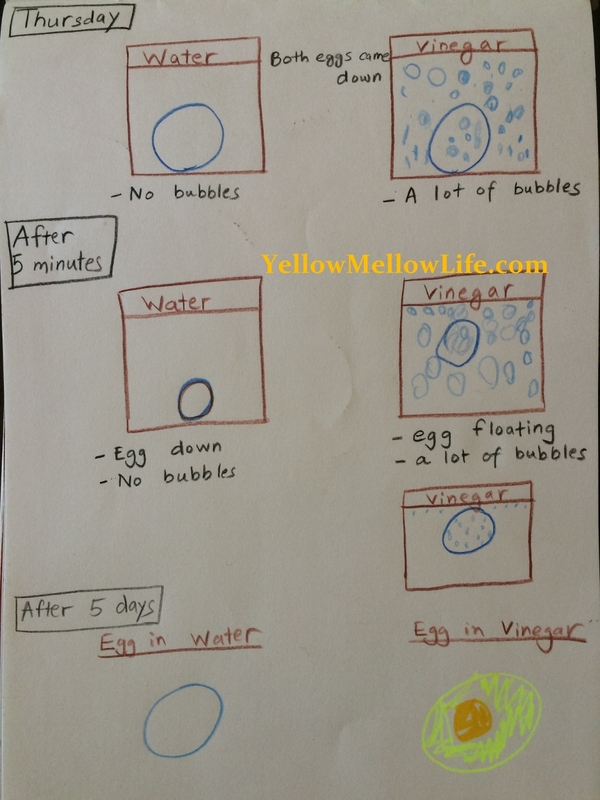 @Rashika – Though Little B didn’t completely understand the science behind it, even her understanding that vinegar reacts with egg shell but water doesn’t is enough for me! Add to it the fun she had with the egg for 3 days! @Sonali – Sure try it girl, this science experiment will make you feel like a child again! @Mini – Thanks Monica, and it’s just not me, we all are inspiring moms! I think all parents should adopt this pedagogy of teaching their kids, this will help them grasp knowledge in a fun way. I appreciate your efforts ….u r a inspiring mom. Next story What’s On Our Mind These Days? June Bugs!